It’s been an amazing journey so far! Each month I donate the money I’ve saved to a different charity. So, for example, I sponsored a Compassion International child (named Ayla) for 7 years… with just 1 month’s worth of savings. With December’s wages I’m planning on donating to Samaritan’s Purse, where $35 can feed a family in Africa for 1 month! That means I can feed 7.79 families for a whole year, just on one month’s wages! Needless to say, I’m super passionate about how much good we can do for others, and that’s why I’m coming to you today. I’d love to challenge you to do something similar just for a month in this new year. I understand that not everyone is as fiscally unrestricted as my 25-year-old, single self. But what would it look like for you or your family to live sacrificially for a month? How much good could you do? How many families could you feed for a month? For those of you interested, I’ve built a list of 7 tips for living on $7 a day. I hope it’s helpful and that it gives you the push to live especially sacrificially for a month in this new year. The second question I always get from people (the first being how do I date… a question for another day…) is what I eat while I’m on this challenge. To be honest, you can eat more healthy than most people, even with just $7 a day. Here’s what I do, personally. Feel free to change as needed for dietary restrictions. Breakfast – cereal and 1% milk, roughly 50 cents (since I get both the cereal and the milk on sale). Lunch – 3 whole carrots, a PB&J sandwich, and a 50% off greek yogurt, roughly $1.25 in total. Dinner – Crockpot meal (often chicken fajitas, soup, etc), roughly $1.50. So in total, $3.25 for a day’s worth of food. Of course sometimes I have a snack or an extra bowl of cereal, but you can see how much this helps my monthly grocery bill. So this one is easier for some than it is for others. I work only 7 minutes from my house (if you hit the 3 lights just right). So my gas bill isn’t huge. However, you’ve got to measure the cost when someone wants to do something completely across town. An example from my time doing the challenge is one night, I drove all the way across town to go 2-step dancing with some friends, to realize I had forgotten my wallet at home and wouldn’t be able to even get in without it. I could have doubled my trip mileage, driving all the way back home, and then back to the dance location, but I had to decide it wasn’t worth driving the extra mileage a second time. A bummer, but if you don’t stay on top of the miles you’re driving, you’ll never hit your budget. Luckily for us, gas prices are still pretty low across the country. One of my favorite things to do, since I don’t have much… if any… recreational budget, is playing board games with friends. Dominion, Citadels, Avalon, and other strategy games are my favorite, but they aren’t for everyone. Find the type of game you enjoy the most, and put together little intimate game nights with close friends. You’ll be surprised as you often have a better time than if you went out or watched a movie. Not into Board Games? What other hobby have you wanted to pursue in the past but put down due to time constraints? Painting? Guitar? Knitting? Find those old hobby materials, pull them out, and give that hobby another try. Speaking of movies, how do you have a movie night on $7 a day? It was sort of hilarious because my home (bachelor pad) lost our Netflix account the second day of my challenge (which was a sad surprise for sure), yet it hasn’t crippled me in the least. I love Redbox and Hulu. Hulu lets you stay up on your shows even if you don’t have cable, satellite, etc. as long as you watch the episode within the first 3 or 4 weeks after it comes out. And Redbox can be made even more inexpensive by signing up for their text alerts. Often getting a free movie on Monday, so you have to return it on Tuesday (when they get their new releases in). It’s not a perfect system, and it is annoying to have to dodge Star Wars spoilers left and right, but if you play your cards right you can still have a movie night at little to no expense. Nights can get pretty long if you’ve cut out most if not all recreational activities. But perhaps this is a great time to consider volunteering your time in an area you’re passionate about. Is your church needing another youth group leader? Do you know of a food pantry that could use weekend help? What other opportunities does your workplace or church provide for you to be the light of Christ in your community? I’ve been especially blessed over the years by our city’s traffic watch program (where we monitor for human trafficking), as well as by the 9th grade boys I lead in my church’s youth group program (young men I’ve been blessed to lead since they were little 6th graders). God can do great things with your time, consider praying for Him to lead you to a volunteering opportunity. So with the new year upon us, many have chosen this time to make a commitment to get in shape. However, instead of joining an expensive gym, you can try one of two different methods for staying in shape. First, many businesses have a gym within their facility that you can use for free. Instead of joining an outside gym, commit with 2 or 3 friends to workout in your business’s provided gym facility 2x a week. You’ll be amazed at what a little social pressure can do for your motivation. I’ve kept the best for last. Believe it or not, many Christians have a Starbucks budget that could sponsor a Compassion International child all by itself ($38 a month). Take a month off of buying any coffee. You’ll be amazed how much this helps your budget. Besides, most work places provide their own coffee, and while it may not taste like that frappuccino you love so much, it’s still got the caffeine you need to make it through the day. Alternatively, work it out with some friends where you trade off who brings in a home-made batch of coffee. With some preparation, you can make even Folgers taste like a treat to be savored. 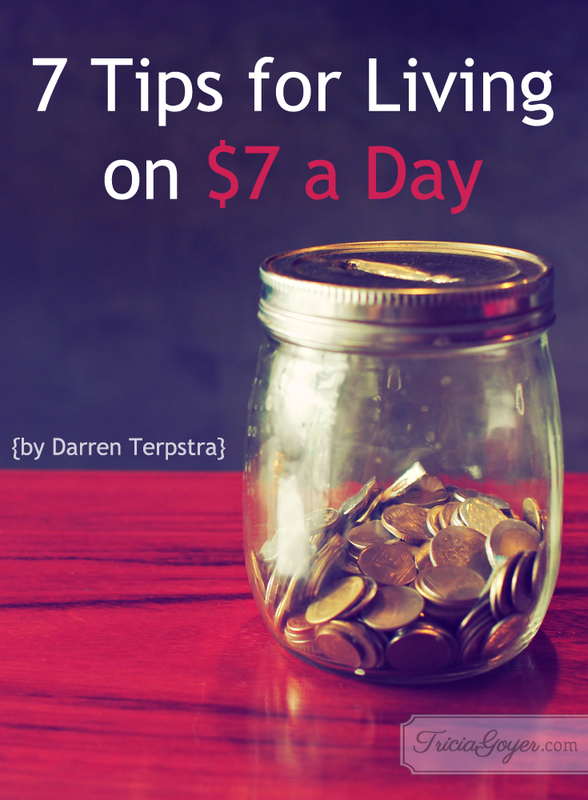 So, are you up for the challenge of living on $7 (or $X) a day? Try it for even just a week and see the blessing you can be for the poor and needy around the world. If we as Christians stand as one for the sake of the poor and destitute (Matthew 25:31-46), we are doing the will of God. So let’s sacrifice a little, so we can bless others massively. If you’d like to stay in touch with me and this year long challenge, please subscribe to my YouTube channel here, or follow me on Facebook here. I’ll be a college student next fall. I’m super frugal, budget like crazy, and embrace a WWII-minded thrifty living. Love this article!